As we slide down the last bit of banister of 2009 and the "If not Now, When?" sign gets ever bigger, its heartening to see the Knights and Ladies out there ticking that Bucket. Before my latest batch of travel I managed to tick a couple of my own last week. 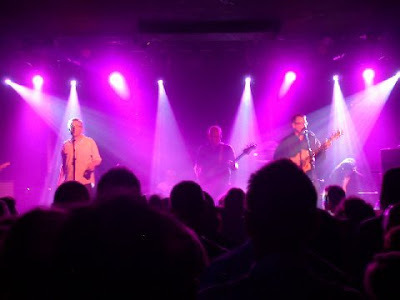 A song that was a veritable sound track to the time i lived in America in the late 80's was "Letter From America" by the Proclaimers. The Scottish twins went on to have a raft of other fine singles too the sort that guys could get emotional too, and sing at the top of their voices, without appearing sappy, most notably "I'm gonna ( walk 500 miles )"
So it was with great sore throated pleasure i managed at last to see the guys at a sell out gig in Oxford, and you can bet my voice was the loudest when it came to the chorus's. 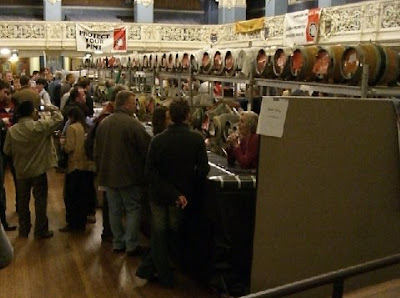 The next day, another event happened in the City that I had never gotten around to going to; The 12th Oxford Beer Festival. Over the years I had supped ale at all the outdoor local events, imbibing under the summer stars, but never entered the Oxford Town hall when one of these mammoth fests was all in one august room. You buy your pint glass with your ticket and off you go into the Aladdin's cave of cask upon cask of British Ale from all over the Isle, not knowing where to start, and eventually not knowing when to finish. They don't serve enough Mild ale in our pubs, and so i headed for the sweet dark tastes that i prefer and found Ruby Mild , by Rudgate Brewery of Tockwith, and Special Mild by Green Mill of Rochdale, Lancashire. I have put the list below to show you just a small sample of the beers available in the UK, and that talk of the demise of the real ale industry is really just that. The guys i met here are serious beer fanatics, and it was good also to see the Hook Norton Crowd putting in a great Showing. now, can you tell me where the Gents Toilet is please? Thankyou. looking at all those 5.5 plus - did you go crawling home?! Oh Plenty Ladies there :)) I gave the bartmaid my phone number in roman numerals. If she figures it out, she's worth a shot LOL..
Suz... did you say you were singing a song about Ticks??? "Lyme Sorry" by Brenda Flea? "Lyme Sorry" by Brenda Flea?" but the radio at work only gets a country station and so I'm listening to it, broadening my music horizons! Lyme Sorry you weren't right! WOW! I would have thought I died and gone to heaven with the Vicars Daughter while I lost my Dog in the Fog! I've ticked a few off the list this year. But of course, with every tick comes a new tat! 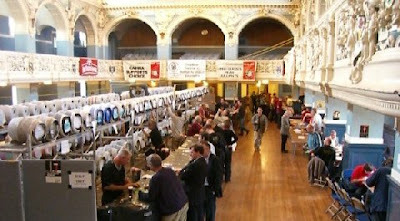 I've just added this Beer Festival to an ever growing list. That's the great thing about Bucket Lists...it creates the illusion of immortality in order to accomplish them all.